It’s a vicious cycle: you’re anxious that you’ll sweat on the first date and ruin your shirt, but you’re so nervous that you start to sweat even more. Now you’re self-conscious about it, and you go throughout your day changing shirts, re-applying antiperspirant, and worrying that other people are noticing the stains under your arms. It’s gone from being slightly embarrassing to completely uncontrollable. You’re in desperate need to eliminate this excessive underarm sweat. Sweating is a natural biological mechanism used by our bodies to cool itself down when it becomes overheated. Underarm sweat is produced by two different sweat glands: Eccrine glands produce clear, odorless fluid that is used to help cool the body, and Apocrine glands produce a thicker liquid that gives underarm sweat its unpleasant odor. Issues arise in people who have sweat glands that are active when they should be at rest. 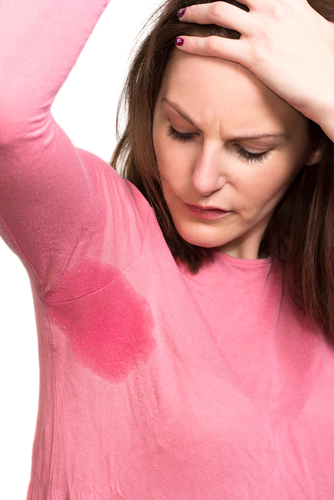 This results in either an overproduction of sweat or a more severe medical issue known as hyperhidrosis. The good news for people with excessive sweat or hyperhidrosis is that there is a solution that helps reduce the amount of sweat produced. MiraDry® is an FDA-approved procedure that can permanently eliminate underarm sweat glands. This is achieved by delivering controlled electromagnetic energy to the area containing the sweat glands. To set up your consultation to discuss how miraDry® can work best for you, contact Dr. Jeffrey Wise at 973-305-1400 or fill out an online contact form here.